Do you love our wiki sample applications but dislike having to download them to just see a few key lines of code? If so, then you'll be pleased to know we have added a new "View Source" feature to all of our wiki code samples! You can now simply view the C# source files without downloading them. Do you love our wiki sample applications but dislike having to download them to just see a few key lines of code? If so, then you'll be pleased to know we have added a new "View Source" feature to all of our wiki code samples! You can now simply view the C# source files without downloading them. This is especially helpful when you're browsing through the samples looking for the one key insight that helps you complete your task with Map Suite. Of course, you still have the option to download the full project to run and debug on your computer locally. But now, in addition, the source code for each file in the project is displayed right on the wiki and is nicely formatted for easy reading. Click on this link and the source code for each of the files in the selected project will be displayed. 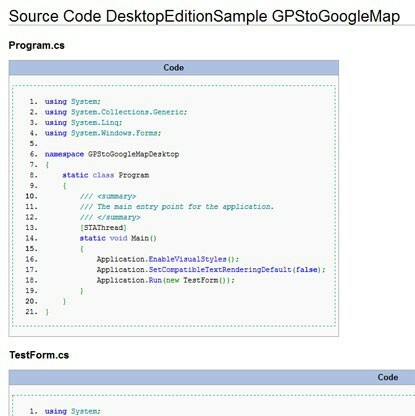 Feel free to let us know if there are any other ways we can help streamline your development with Map Suite!